About LeeTrevino - The Hat Trick: The 100th Open, played in fine weather at Royal Birkdale, featured two charismatic players of differing pedigrees. 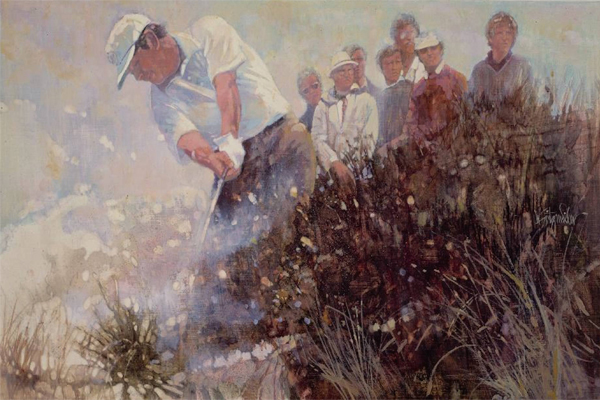 Lee Trevino won the Claret Jug for the first time and, following triumphs at the US Open and the Canadian Open completed a unique hat-trick of victories within only four weeks. He was playing in his third Open. Lu Liang Huan, of Taiwan, had been a professional since 1955 and had played in The Open only once before. Doffing his pork pie hat wherever he went, “Mr Lu”, as he was known, immediately became a crowd favorite. Trevino shared the lead on both the first two days and led by one from Lu and Tony Jacklin going into the final round. He was in irresistible form early on, with four birdies in the first six holes. At the turn he led by six strokes but Lu made birdies at the 13th and 15th holes and then Trevino had a double-bogey 7 at the 17th so the lead was down to one at the last. Both would birdie the last but it was a traumatic finish for Lu as his second shot hit a female spectator on the head. Visibly distressed, he composed himself to take second place. Other than the first day, when Trevino had a 69 to Lu’s 70, the pair had returned identical scores: 70, 69 and 70, with Trevino winning with a 278. Jacklin, with three birdies to finish, took third place. Peter Oosterhuis set a new course record of 66 in the third round but ended with a 76 the next day. Trevino went on to defend his title the following year, while it was also in 1972 that Lu had his greatest moment, helping Taiwan win the World Cup of Golf.